The keeners in the group would state that it is a figurative expression that translates roughly as “once you start to travel, your eyes and all your senses—become attuned to new experiences that take you beyond your daily routine. Indeed, once you travel, your senses (seeing, hearing, feeling, smelling, tasting) are never the same again. But hold on, I mentioned 7 senses in the title—and I will return to that shortly. Sometimes travel counsellors don’t take into account the power of the senses when selling travel. “Seeing’ is the sense that is the easiest to address in most cases. Show them a brochure and your travel photos. Point them to some relevant websites and trust that the person in front of you is a ‘visual’ learner: one who takes in information by seeing it in person. The problem is that while ‘seeing’ is associated with believing the facts about an all-inclusive or a package tour—or even an FIT, the other senses should not be discounted when it comes to selling an experience to a client. Recently I had a bit of an eye-opening experience with music. 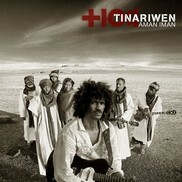 I heard about the band Tinariwen about a year ago. The members are originally from Mali in West Africa but for political reasons, they fled to the southern Sahara desert. Originally making their own musical instruments they started to play local concerts and now they are internationally known as the ‘Saharan Guitar Rebels’. The club where I saw them was sold out and people of all ages were wrapped up in the melodies and rhythms of northern Africa . When I went to the local record store to buy a CD, the young 20-ish clerk knew exactly where to find the Tinariwen section and commented that the group was ‘amazing”. The interesting thing in all this, from a travel perspective, is the ever-growing popularity of world music to the current generations (mature travellers, boomers, gen x’s and gen y’s). The popularity of ipods and MP3 players testifies to the power of music. To the travel seller, this tells us a musical component to the sale of a new destination (or even a previously visited destination) will add to the selling experience. How do you do this in a busy agency? • Get a co-op student to put together a list of your most popular destinations and then research 5-10 singers and songs from each. • Consider buying download credits from itunes (or similar) to give to your client. • Have some catchy local tunes on your computer that you can play as background to a short slide show on the destination. • Contact an mp3 player company to have a draw for a player or if you have a very high-end client, pick up a small inexpensive player and present it to your client as ‘something to load up with music and play while you are at the health club or lying on the pool deck”. A small homage to the sense of hearing could make the difference between a travel agent who sells information, and a travel counsellor who provides counsel and sells the experience. Other senses we can touch on, include, of course, ‘touching/feeling’. Way back in 1988 we gathered in the home of our Kenya tour operator and he passed around some Kenyan masks, a few Massai spears and some Makonde carvings. The first reaction of just about everyone was “I want one; where do I get one; when can I buy one; how much time will we have to shop for local ‘souvenirs’? While I was personally voted as the most prolific spender on the trip, everyone in the group ended up buying some of the souvenirs that had inspired us before we have even submitted a deposit for the tour. The operator had cleverly arranged for us to ‘touch’ Kenya and appreciate the local crafts as part of the sales process—and it worked. Any travel counsellor can cater to the sense of ‘feeling’ by having a local souvenir on hand for their most popular destinations. Go back to your co-op student and suggest that they also put together a list of restaurants in your town or city that serve ethnic foods. When you sell Asia, you can provide your clients with a list of Asian restaurants or the same could hold true for clients bound to just about any destination in the world. If the country involved is known for dried fruits, then keep some handy so you can give the client some dates from Abu Dhabi or pistachio nuts from Turkey. And likewise, it you want to cater to the sense of smell, you can prepare some sachets of spices or other scents to evoke an experience of the destination. Just think of the next destination information evening where you have your audience close their eyes, as you hand out sachets of middle eastern spices and ask them to envision themselves in an exotic souk (market). No, not the movie. But the 6th sense is that intuitive impulse that says either ‘let’s get out of here’ or ‘let’s go, I need to visit ______”. A travel counsellor obviously wants to stimulate the 6th sense in the client’s mind that tells them that YOU are the person that satisfies their need for expertise and therefore, there is no question that they should purchase travel from you. This is a strong sense that is formed by the client once they discover your industry credentials, as well as the unique way that you are selling travel. At a recent wine-tasting in Chile, the guide explained that after you use your senses to determine the quality of a good Carménère, you need to invoke one more sense—and that is your sense of humour—once you have had too much to drink and you happily smash your glass against the wall. While I am not recommending this as part of your sales technique, the humour part of the equation does work and helps to further establish a comfort level with your clientele. Laughter releases those endorphins that make people happy. The point is that we all need an injection of creativity from time to time. Catering to more than just the sense of ‘seeing’ can go a long way in building a relationship with your clients, as well as adding that small ‘edge’ that separates your counselling skills from those of a travel agent down the street. Next time you are at the supermarket and the sight, smell, feel, touch and crunch of fresh produce evokes memories of a pleasant travel experience you once had, think of this now as a lesson in professional development.